Estimate of take "between 6 and 10 million euros [$8.5 million to $14 million]"
Suspect described as around 50 years old, wearing suit and "Borsalino-style hat"
(CNN) -- Life imitated art in Paris on Saturday. 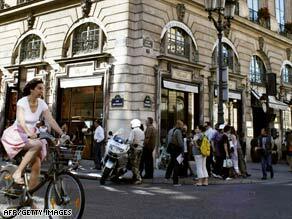 The prestigious Chopard store in Paris was the site of a brazen holdup Saturday. A thief staged a brazen, daylight holdup in an upscale district of the French capital, stealing at least $8.5 million in jewelry from the prestigious Chopard store, police said. A spokesman for Paris police told CNN the man escaped after holding people inside the store at gunpoint. He provided no other details, but police investigator Olivier Lebon told CNN's Paris affiliate BFM-TV, "From the first elements we have, it would be a man who's around 50 years old, who was wearing a suit and a Borsalino-style hat, who, like any client, walked inside the jewelry store, held up employees with a handgun, was then given items displayed in the window. "The amount of the loot is estimated between 6 and 10 million euros [$8.5 million to $14 million]." Later Saturday, the Chopard store displayed a sign saying it was closed. The incident conjures memories of the 1970 French film "The Red Circle," starring Yves Montand and Alain Delon, in which thieves conducted a nighttime heist at another jewelry store on Place Vendome. Last fall, the Chopard store was featured in "Mesrine - Public Enemy Number One," the two-part bio-pic on Jacques Mesrine, the legendary 1970s French gangster. The Geneva-based, luxury watch, jewelry and accessories business was founded in 1860 by Louis-Ulysse Chopard, according to the company's Web site. CNN's Deb Krajnak contributed to this report.